Profile by Jess McClean: Chimney Swifts are small, grey-brown birds found in Houston from March to October. They are best identified by their silhouette- slender bodies, round heads, long, narrow, curved wings and short, tapered tails. Their wide bills are so short that they are often hard to see. They have a distinctive flight style, with stiff and shallow wingbeats, and chittering call. According to the North American Breeding Bird Survey, Chimney Swift populations declined by 2.5% per year between 1966 and 2015, with a cumulative decline of 72%. This is in part due to the decrease in suitable nesting habitat, with traditional brick chimneys deteriorating and modern chimneys not providing suitable nesting sites. Chimney Swifts breed in urban and suburban habitats across the eastern United States and Canada. They spend their winters in Peru, Ecuador, Chile, and Brazil. While they do use natural nest sites, such as hollow trees and caves, they primarily nest in chimneys and other man-made, low light areas with vertical surfaces, like air vents or wells. Once they have chosen a nest site, the pair constructs a half-saucer shaped nest made up of twigs, stuck together and to the wall with a glue-like saliva produced from a gland beneath the Swifts tongue. Chimney Swifts spend almost all their time in flight, only stopping to roost overnight or nest. They even bathe in flight, gliding down to the water's surface and smacking against it, then bouncing back up and shaking the water from their feathers as they do so. Unlike most birds, Chimney Swifts cannot perch. Instead, their long claws are suited to clinging to vertical walls. Look out for these energetic birds in the late afternoon and evening, foraging in small flocks high above urban and suburban areas as well as rivers, lakes, forests, and fields. Chimney Swifts are highly beneficial birds from man's point of view. They are voracious eaters of flying insects including mosquitoes, flies, ants and termites. Unlike martins, they don't mind if a yard has tall trees. 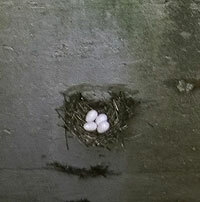 Their only requirement to nest is a chimney (non-ceramic, non-metallic) or chimney-like structure. If you have a metal or ceramic chimney, please cap it to prevent swift injuries. If you would like to have Chimney Swifts nest in your chimney, remove any grate that may be on the top during the nesting season (March - October). The only precaution you must take is to make sure the chimney flue stays closed. When there are young in the chimney, you may hear some fluttering from time to time which sounds very close to the flue. This is caused by the young exercising their wings and is no reason to panic. Swifts leave very little debris in the chimney from their nesting activities and are very clean birds. If you decide you do not want swifts to use your chimney you should close off the chimney entrance with a wire grate. This procedure should be done in the November - February period, when there are no swifts in our area. It is against the law to tamper with the swifts and their nests once they have started using your chimney. Sometimes it is impossible for swifts to use your chimney, either because of its design or because of problems with predators. In the past few years several designs have been developed for chimney swift towers. Plans for towers and more information about Chimney Swifts may be obtained from the links below. The ChimneySwifts.org website was formerly the Driftwood Wildlife Association. Posted on Texbirds on May 16, 2007. 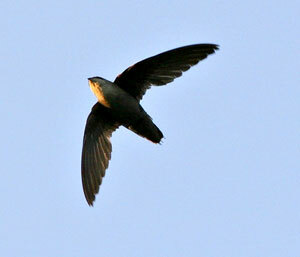 While a large number of roosting swifts does not mean a large number of nests (one nest per structure is the norm regardless of the size of the structure), it does not preclude the existence of an actively nesting pair of swifts, and disrupting even one pair is a violation of the Migratory Bird Treaty Act. In fact, it is not uncommon for a nesting pair to share a structure with a roosting flock. The nest is generally low in the structure while the non-breeding birds roost over-night in the upper portion. 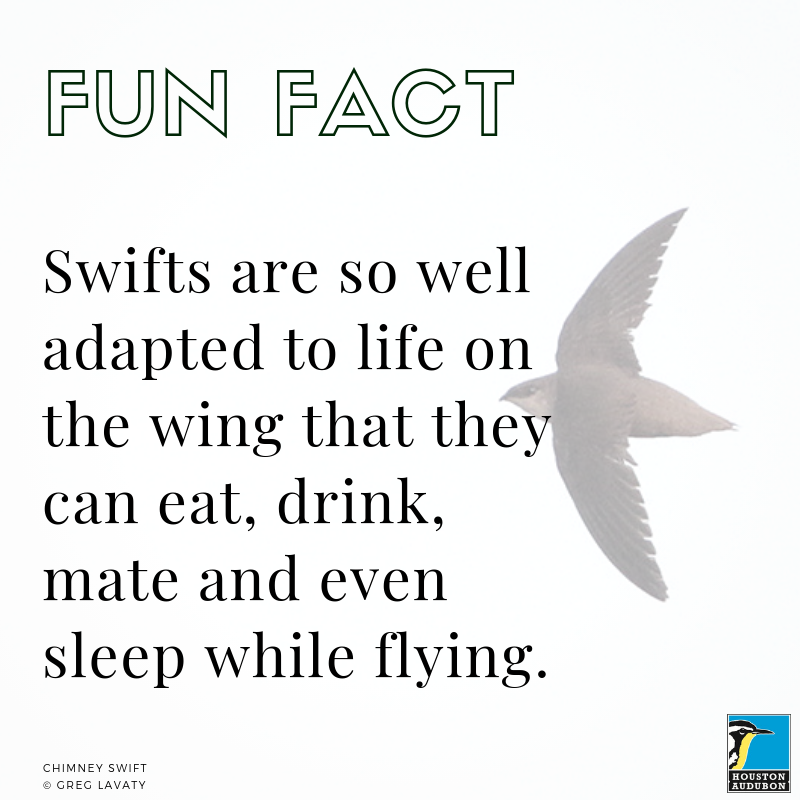 We have observed this behavior for more than 20 years in the towers that we have built and maintain at Travis Audubon's Chaetura Canyon Bird Sanctuary and Chimney Swift Observatory. There are currently two towers on the property with this configuration at this time. Large structures such as the Pershing Middle School stack are being decommissioned on a regular basis all across North America. They are not only important migratory way stations for the swifts, but places where increasingly large numbers of non-breeding swifts can find relative safety throughout their stay in the northern hemisphere. As recently as two decades ago, Chimney Swifts were seen roosting in large numbers only during migration -- primarily in the fall. Today it is not unusual to view large numbers of swifts funneling into suitable structures through out the summer months. The speculation is that with the decrease in suitable nesting sites (clearing of traditional habitat with large hollow trees, capped chimneys, demolition and new construction with metal rather than masonry chimneys) non-breeding swifts are congregating in large suitable structures -- like the one at Pershing Middle School. It should be noted that although Chimney Swifts are often overlooked by birders and conservationists alike, their numbers are in dramatic decline. This is particularly evident on the outer fringes of their breeding range. The Committee on the Status of Endangered Wildlife in Canada (COSEWIC) has recommended that Chimney Swift be listed as "threatened" in that country. This should be a wake up call for those of us in the States.